The modjeska owes its name to a Victorian-era candy maker's infatuation with a Polish actress. Muth's Candies sells thousands of pounds of Modjeskas annually. 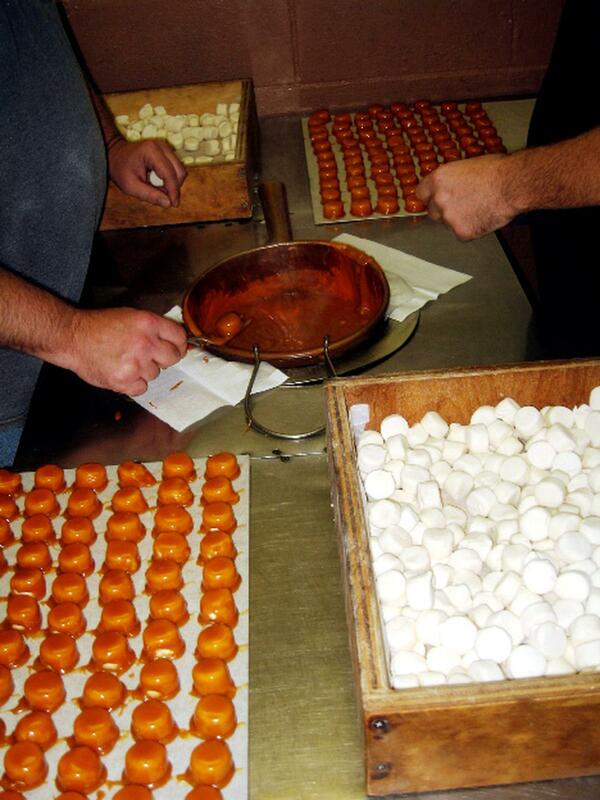 Each marshmallow is dipped in a secret caramel mixture by hand. In the back room of Muth's Candies in Louisville, Ky., Jonathon Skaggs and Bobby Masterson are busy dipping marshmallows into a copper pot. The pot is filled with a top-secret hot caramel mixture. Skaggs and Masterson tap the excess golden caramel off each candy before placing it on a board to cool. Masterson says it's a rhythm repeated hundreds of times each day. "They're good ... they're a big-time seller in here in Kentucky, especially right here in Louisville," Masterson says. "There's a lot of people that come and get 'em." 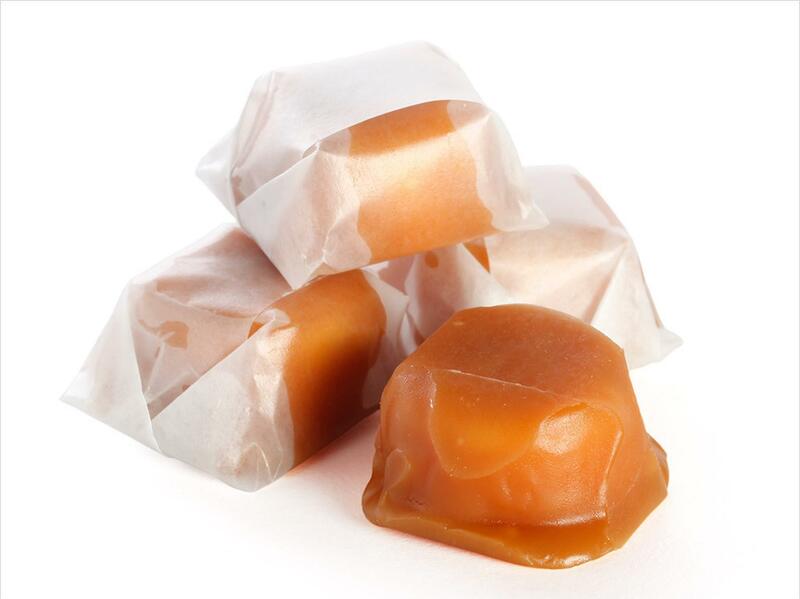 The soft, sticky candy was created by Anton Busath, a French confectioner who immigrated to Louisville. The candy maker spent years perfecting his "caramel biscuit." He gave his chewy creation an evocative name: the Modjeska. Busath was enamored with Polish actress Helena Modjeska, who performed in theaters near his downtown Louisville shop in the 1880s. The Shakespearean actress was hugely popular in the United States. Busath's candy "was a way of encouraging — consuming — your actress," says Beth Holmgren, a Duke University professor who's published a biography of Helena Modjeska. Modjeska — like the sweet that bears her name — still has a dedicated following today. "There are lots of things named after her, [but] the candy is the only thing that's still sold," Holmgren says. "It is a heavenly piece of candy," says Rose Ann Stacy. Her family has run Muth's Candies, on Louisville's East Market Street, since 1921. Other stores in the region make their own version of the Modjeska, but Muth's lays claim to the original recipe. After Busath's store was destroyed by fire in 1947, his son gave the recipe to Muth's. The East Market Street neighborhood fell on hard times in the 1960s and 70s, when large numbers of city dwellers and business owners moved to the suburbs. But the area has been making a comeback in recent years, and art galleries, restaurants and antique shops have opened. It even has a new nickname, "NuLu," short for New Louisville. With some help from the Modjeska, Muth's has withstood the neighborhood's many changes. The candy remains the shop's most popular treat — thousands of pounds of Modjeskas go out the shop's doors each year. Guests in some Louisville hotels even find a complimentary Modjeska on their pillows. And Stacy is always happy to unwrap a free sample for visitors who stop by the shop. She loves watching people melt the first time they try the buttery caramel. "If anybody has ever lived in Louisville ... they call and get them," Stacy says. "Because they have ... to have their Modjeska fix." Just such a Modjeska craving brought Amy Harty into the store recently. She's a Louisville native who now lives in New England. "They have a very special flavor, nothing of which I've ever had before," Harty says. "And people say the same thing in Boston. They're just like, 'Wow, these are so good!'" Copyright 2012 Louisville Public Media. To see more, visit http://www.prp.org/.